I’m going to try and not fill up the blog with Swing Journal entries. I will try to keep the Swing Journal entries to no more than once per week as the blog is really about looking at a smorgasbord of things involved with golf that the reader can find interesting and useful to improve their own game. However, this week I would like to get a few entries in as I want to go into my current swing philosophies. Again, these Swing Journal posts will be tagged as ‘Swing Journal’ for readers to easily go back and view if needed. And here’s one that I took of myself about a year ago, right before I started striking the ball extremely well. We can see some differences as my backswing is more upright and my downswing is steeper, both of which I have been trying to avoid. Currently, I still work on a Kelvin Miyahira (www.kelvinmiyahiragolf.com) swing discipline. I have worked on this swing with both Kelvin and Lucas Wald. It’s very easy to get into a rut with any coach, but when you feel you’re onto something good it’s hard to make that change. Instead, change over to a new coach but keep the philosophy the same. Eventually, you can go back to that original coach. You can read about Kelvin Miyahira’s swing philosophies and research on his blog on his Web site at www.kelvinmiyahiragolf.com. 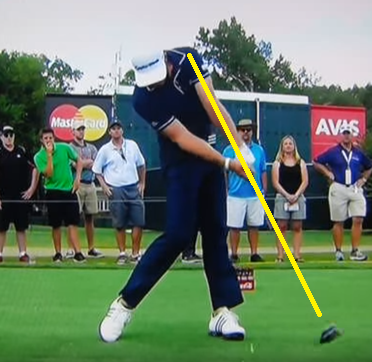 I think the most popular misconception about Kelvin’s work is that it is based on hitting it long or that it’s based on the Jamie Sadlowski golf swing. In essence, my perspective on Kelvin’s philosophy is that he feels that the ‘Drive-Hold Release’ is the superior release style in golf. So, it’s not actually about swinging like a long driver as many of the Re-MAX long drive competitors do not have a Drive-Hold Release. 1. It’s a release pattern with a slow Rate of Closure. 2. It’s a release patther with a slow ‘overtaking’ rate. The rate of closure will affect the golfer’s ability to control the face. Are there great golferst that have a high rate of closure? Sure. Phil Mickelson and Martin Kaymer are great examples. However, their ballstriking tends to run hot-and-cold with Mickelson being, at times, a dreadful driver of the ball (historically a great iron player). Kaymer has been as good as the #1 ranked player in the world and a US Open winner to a guy that seemingly falls off the face of the earth. When they are running on all cylinders they are very long off the tee and tough to beat. But their level of consistency with their ballstriking is a different story. Players with a high rate of closure release styles will be referred to as a ‘roll release.’ They are rolling the forearms, wrists and hands and they swing thru the ball. Many people confuse the ‘flip release’ with the high handicapper ‘flipping at impact.’ The difference in the ‘flip release’ by a Tour player is that they are typically ‘flipping’ thru and after impact whereas the high handicap ‘flipping at impact’ starts to flip prior to impact. The good news about the flip release is that a player can be very accurate with a flip release if they are are not ‘rolling’ the release. The face angle is stable and that means shots are starting more on-line and are curving less. Also, more of the flip release players on Tour tend to be good from 75-150 yards. Unfortunately for them, those shots don’t count as much as shots from 150-225 yards and drives off the tee. The dreaded release is the ‘flip-roll’ release where the golfer has a high rate of closure and a high overtaking rate which means difficulty in controlling the face angle and the dynamic loft.